Partnerships are key to the success of a complex project such as Theun-Hinboun, which works on various levels of industrial production, business development, social planning, provision of public services, environmental conservation, and natural resource management. Close partnerships with local people and authorities are essential, and THPC maintains offices in resettlement villages and in the district towns of Khounkham and Lak Xao so that dialogue is always open. Project area residents are able to register their needs or grievances with THPC staff, who in turn maintain coordination with village, district, and provincial services in both Bolikhamxay and Khammouane to ensure delivery of program commitments. At central level the company has strong links with government departments such as the Ministry of Energy and Mines and with line ministries that help deliver services in the project area: health, education and transport. THPC has forged partnerships with international organizations to deliver specialized services in these sectors, including Basic Needs and Save the Children. 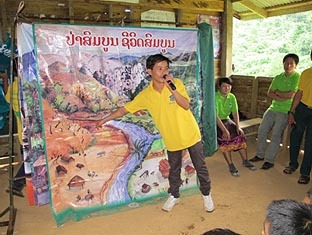 To help frame appropriate responses in villages, the company also works with various Lao civil society organizations such as COPE, the Don Khoi Children's Development Centre, and PADETC. The Ministry of Natural Resources and the Environment monitors THPC performance in terms of water quality in the project area and downstream, and also provides assistance in framing environmental protection measures in surrounding forest. International conservation agencies, in particular the Wildlife Conservation Society have also given valuable assistance and advice in this area. Close relations are maintained with THPC's two customers EGAT and EDL, and of course with the company shareholders, all of whom provide services that help project operations.